I was determined that I wanted a doll with the WWII KEEP CALM poster as the body but it needed to say KEEP CALM AND COUNT TO TEN and fit in the body of the doll. Humm. So this is what I went thru to make that happen. although when I played with it, it looked a bit thin. One of the nice things about the Mac, and the ancient program I use is you can force a BOLD effect on a font even when you don’t have a BOLD weight installed. That seemed to bring it closer in line with the poster. To get THAT, I found a poster here in SVG or PNG format, which I grabbed. 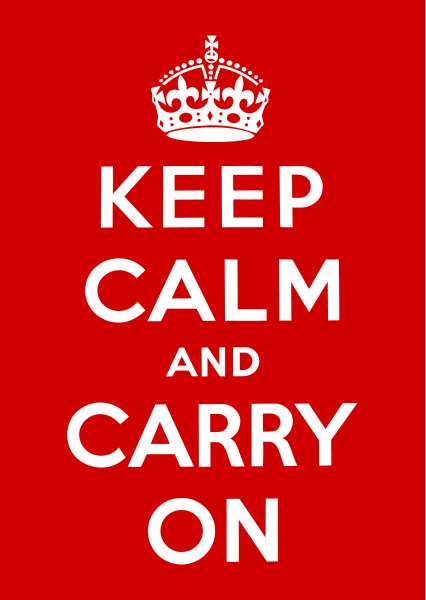 OK, so then I opened the poster in Appleworks Paint and filled the CARRY ON letters with the red. I could have done this in Photoshop, bit I wanted to slightly increase the letter weight and can only do THAT in Appleworks. So I added the text I wanted and saved it. 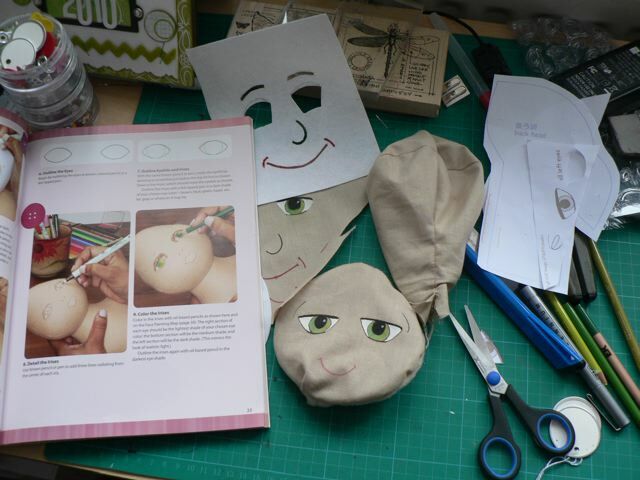 I opened THAT up in Photoshop then opened the PDF of the doll bits and copied the body only using the TOOLS. I opened a new Photoshop file, transparent, RGB, and pasted the body. I filled the body with black then removed the surrounding white bit, resized the poster and dragged it over the black image. I Grouped with Previous (old, old Photoshop) and that filled the body with the poster. Because of the curved middle I had to make the poster smaller than it should have been so I just then filled the rest of the black body with the red paint. I printed THAT on to white cardstock, with a matte paper setting and photo quality and that will work for me! No comments from smug digital experts who can tell me 10 different easier ways to do this LOL! I may take the scenic route, but I get there in the end! The font is not perfect, and on further reflection I may have simply deleted ALL but the crown and filled it with my font choice, but frankly (as my first doll testifies) I am NOT a perfectionist (Carmen, your daughter and I should meet – I think we are a lot alike LOL!) and it’s good enough as it is. At this point I am at four completed dolls with two more on the go, and looking at my window that may be all that can fit, especially if I interspersed the dolls with words (still thinking NOTES TO SELF) and they are turning out to be a real eclectic mix of scrapping, stamping, fabric, digi work, and more. I can’t tell you when I have had more creative fun. Hope I am not boring you with these little cautionary ladies – I have so many ideas for other versions on them that I am in danger of getting obsessive! I’ll share the others when they are done. I just love my sister. We don’t agree on much – she’s a Republican, I’m a Democrat, she’s a bit religious, I am SO NOT, she is a confirmed digital scrapper and I am firmly in the paper and glue world – but it doesn’t matter at all. We talk almost every week, thanks to a US phone number that rings here in the UK, and she is at once good and bad for my ego. She reads my blog and tells me I am a “scrapping goddess” which is nice to hear but sometimes leaves me in danger of believing her, making my head swell to unreasonable proportions. Combining that with a comment on one of my YouTube slide shows this week, which is possibly the nicest thing I have ever had posted as a comment, my feet had left the ground, a bit. Now SI has stopped, I don’t even have the regular smacks downs telling me how old hat and rubbish I am to ground me LOL! So yesterday I was starting a project that was mostly an experiment based on a few templates I found online. 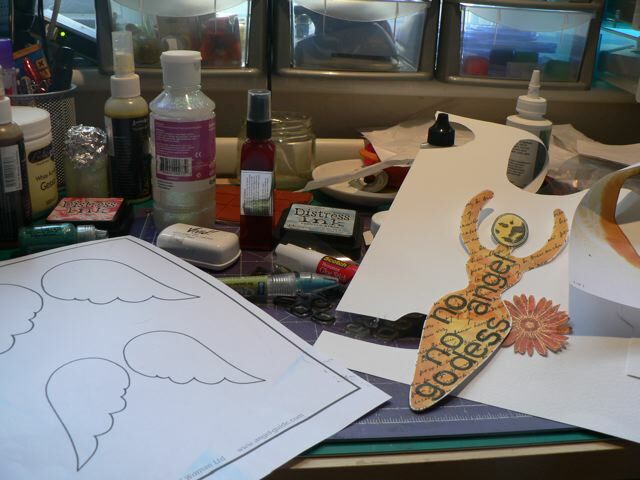 Printable paper dolls and mermaids to cut and decorate here and a load of differently sized and shaped angels wings here really sparked my creativity. 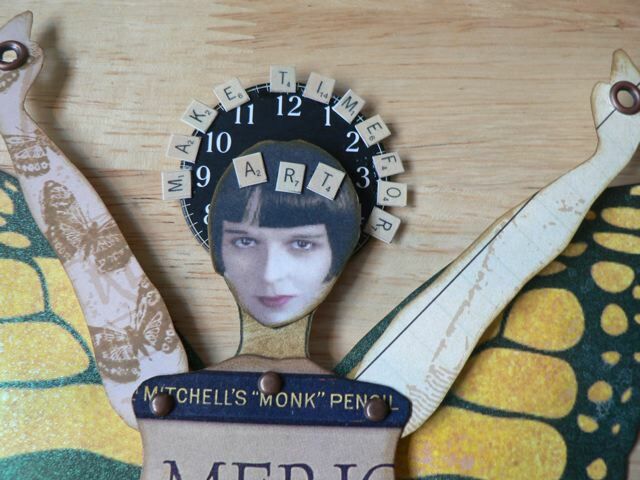 Although I am totally in love with mini-books nowadays, I consider myself primarily a scrapbooker – I often say I am no stamper, but I can manage a decent effort if I concentrate. So I was playing, not really intending to have something keep-able, just playing with techniques and my new Distress Ink bundle and made something I rather liked. I realized I had mis-spelled GOD(D)ESS but as I didn’t intend it as anything other than a creative exercise (it was on plain printer paper for a start) I didn’t let it bother me. The more I thought about it the more I really didn’t want to start the whole thing over again, as I was liking how it was progressing. 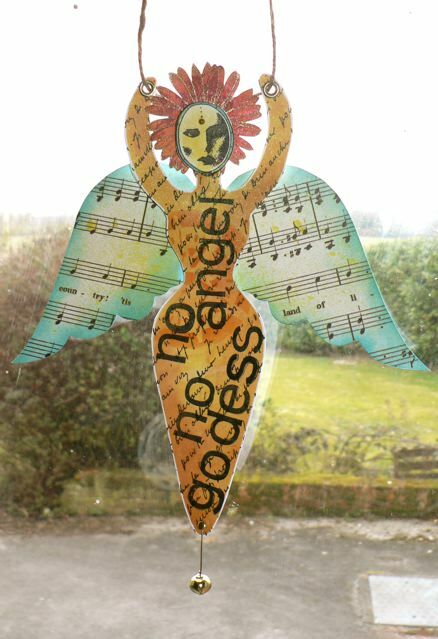 This morning I finished it and decided where the whole thing was heading – I will be making more of these, and string them as a little banner at the top of my window. 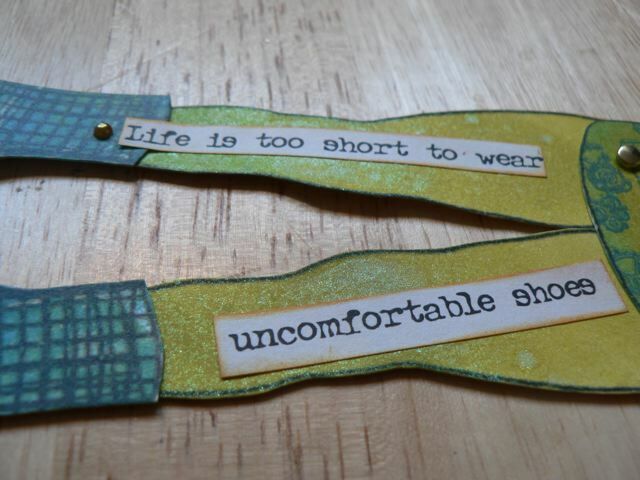 Each one will be something I need to remind myself. Categories: musings, non-scrapbooking, stamping, WOYWW | Tags: AARRRRGGGGHH!, dolls | Permalink. I generally don’t post on a Saturday, too much family life going on, but I snapped a couple of quick, not terribly good photos of the “last Doll” and the collection of “friends” so I thought I would add them. And it’s Sakeena’s birthday today so I have to wrap her present and make a cake. You think I’m joking? I am so not! Categories: non-scrapbooking | Tags: dolls | Permalink. Worded on a couple of things yesterday. Another flower – this time I used canvas fabric and a flocked badge from Paperchase . The colour is better IRL than I think it appears in the photo. I used the Distress ink, Spiced Marmalade and Mustard Seed, to colour the canvas then stamped over it with Staz-on and a big Hero Arts stamp with word on. 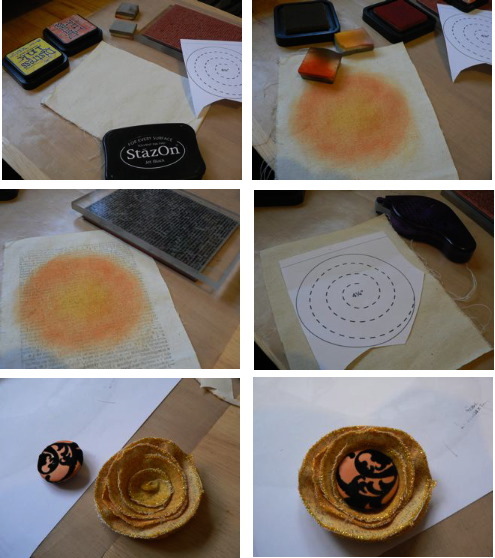 Cut, Stickles, and the same technique for curling the flower onto a sticky-covered cardstock circle. I had a few of the Paperchase badges forma layout I made a couple of years ago so I pried off the pin back and stuck that in the middle. Except for the Stickles drying time these flowers are really quick to make and I love the look of them. I want to try using Liquid Pearls instead today, for a softer, no-glitter effect – with soft colours I think it will look very pretty. And the other thing was a doll, from a free pattern here. I had an email conversation with the designer a year or so ago, when making another doll, and she sent me a link to a page that had a bit more info – in particular her method for sewing up, which is to double the fabric, make a full freezer paper pattern, iron it on and sew around it then cut, rather than cutting with a seam allowance then sewing. Brilliant. And such a cutie. DD wanted a Chinese doll (quite the Rainbow Coalition. doll-wise, at our house – we have one African, two Indian and now 3 Oriental dolls, plus two pure american ones and a couple British ones) so I found a colouring book page of Mulan and made the face from that. The fabric paint I have bleed all into the fabric so I fell back on my trusty scrapping supplies and drew on the face – Sharpie bled too so I used the Precision Pen and worked on the ironing board – draw a little, heat set quickly, and it worked. I used the Tulip Slick fabric paint to do the whites of the eyes and then filled in the lips with white and painted over them – I tried a Bic permanent marker, which was ok, but DD wanted really red lips so had to adjust. She is mostly done, except the hair, although I am not sure of the proportions as I did the head a bit different. the Pattern one seemed very small to DD so I increased the size a bit and made the face more of an oval. As long as she is happy, it doesn’t have to look “real” so I don’t stress about it. Not sure what DH will say about another doll that needs carting up and down the stairs every day (since he usually carries them!) but I have extracted another promise that this is, truly, the LAST DOLL, so fingers crossed! 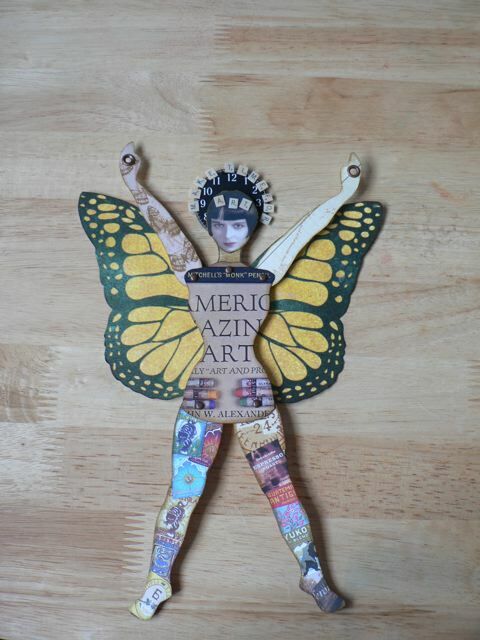 Categories: non-scrapbooking, scrap related | Tags: dolls | Permalink. So our Christmas dinner is likely to come on Boxing day and we will eat out of the freezer for now – which means slim pickin’s as I don’t usually have frozen food (well ice cream and ice cubes and a pack of chicken tenders and a pack of hot dogs for emergencies and usually a bag of dumplings after we go to the Chinese market in Reading … oh! and a bag of frozen peas to use as an ice pack for minor injuries LOL! )so I’m hoping DH gets back from London in time to at least pop into a shop in town and grab a few things to round out a meal. Not the Christmas I imagined but hey ho. As long as we can spend it as a family, all together, that’ll do me. 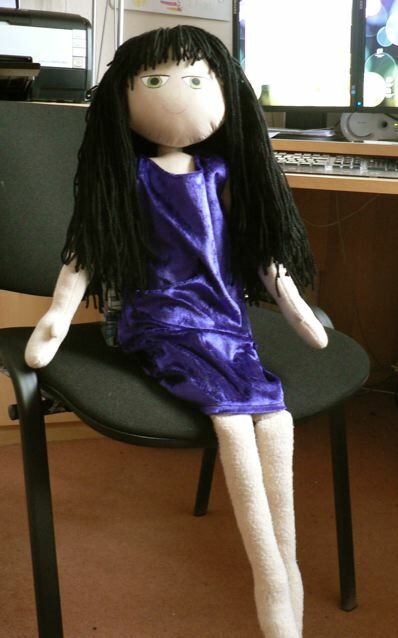 And the good news is the forced isolation meant I DID finish the “last” doll! 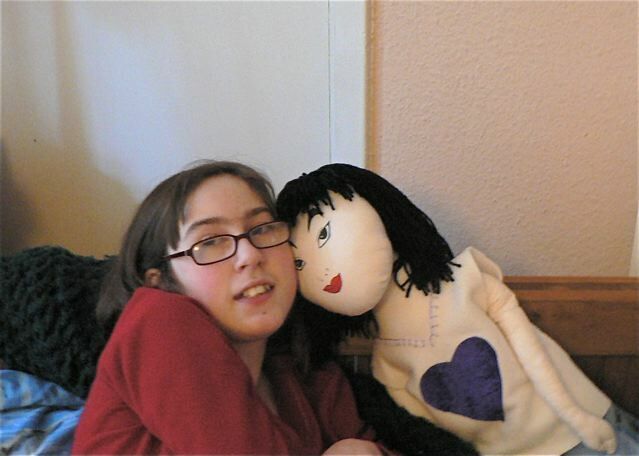 Here is Mariah (or maybe Mitchie or perhaps Mimi – I think DD is not entirely sure yet!) all done. Not a brilliant photo, but you get the idea. She does actually have a nose, you just can’t see it very well, and DD was VERY insistent she not have eyebrows or eyelashes (I did put on eyebrows but they are mostly hidden by her hair because she just looked a bit STARTLED without them) and have a “small smile” so my artistic creativity was slightly curtailed by her desires. But I have to keep telling myself it’s HER DOLL not mine. Now, if I can just keep DD occupied with a Christmas film or two I can get on with sewing all those uniforms! 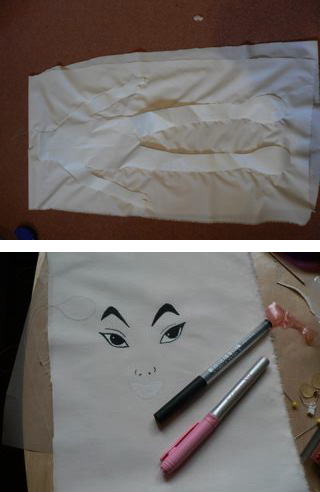 We already had to have a birthday party for Alicia (another doll – DD was very keen on having a Mulan doll but finding one was impossible so I downloaded a Mulan wallpaper, printed it on tee shirt transfer paper and ironed it on to some fabric, then used THAT as the face. The whole thing was of questionable success as I didn’t realize the pattern needed cutting out with an added seam allowance (ALWAYS read the full directions before you start!!) 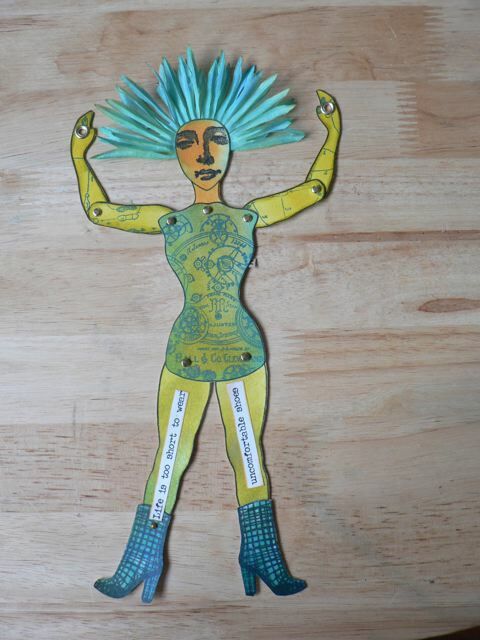 and she has pencil thin arms, lopsided and wonky shoulders, HUGE feet (that was actually part of the pattern, not MY fault) and a giraffe neck with a big bulge at the back of her head when I tried to add a cardboard tube between the head and body to keep the head from flopping over! – bizarrely, she seems to be DDs favourite) yesterday, and I had to take time out to make her a birthday outfit. Wow. I know I do like my parenthetical inserts but that one was a bit long and multi-nested even for me! Sorry about that. I tend to write as I think, and my head is always so very full of things that I struggle to keep a single train of thought on track. 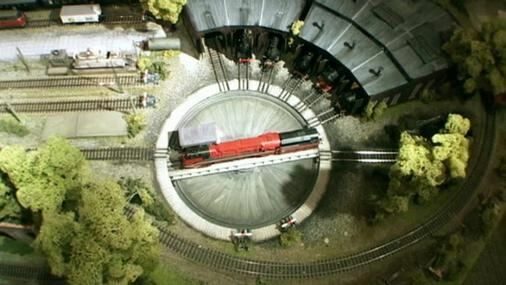 Going back to DSs Thomas the Tank Engine days, my thought process is a bit like those rotating platforms that shift the trains into their sheds for the night. My train of thought is on a constantly rotating platform and taking trains out, putting them back in, then taking another one out tends to happen even within a sentence. I’ll spend the day cleaning up the mess on my desk (and floor, and every other available space) and watching for any delivery trucks that manage to make it down the road as we have LOTS of outstanding deliveries expected and I am hoping at least some of them will arrive today. Have a Happy/Merry Christmas and/or Happy Holidays, if you prefer! In a mad rush to get all the sewing done for DD for Christmas. 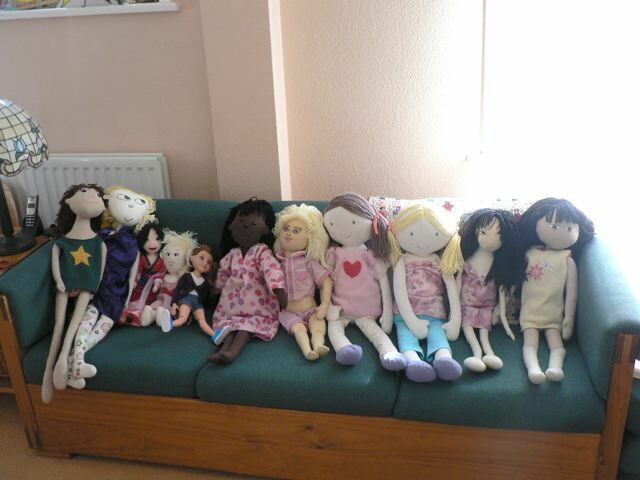 As I mentioned I have made her a number of dolls, trying out a number of patterns, from a number of different materials. Painting the face for the “last doll” (I made her promise me this is the last one I have to make) and will finish her TODAY for sure. from a pattern at this site and some eye painting tips from the Doll Fashionistas book by Ellen Brown! And a shot out my scraproom window! DH and DS are on the road trying to get some food and coal. Fingers crossed they get out and back OK! 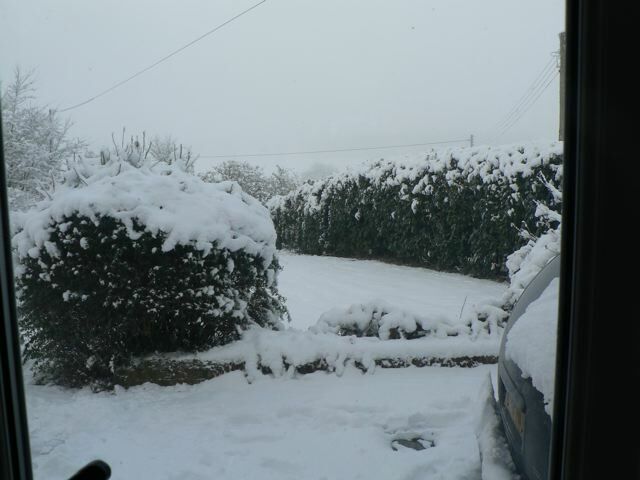 We had a double lorry completely blocking the road, part in our drive, angled like a Z across the narrowest part up until about an hour ago (it sat running since about 3PM yesterday then a second lorry tried coming down the hill this morning and for a while we had two of them stuck!) but they managed to move at some point. With luck we won;t be eating Chinese dumplings and hot dogs for Christmas dinner!! Categories: non-scrapbooking, WOYWW | Tags: dolls, gifts | Permalink.